Alumni who played football for Head Coach Dave Nelson in the 1950s gather at the home of Nelson's widow, Shirley. 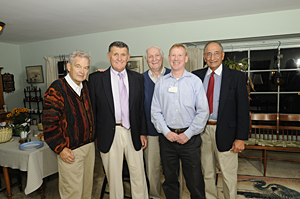 Among them are (from left) team captains John Borresen (1953), Joe Harvanak (1957), Paul Mueller (1952) and (far right) Vince Grande (1955), with (second from right) John "Chip" Taylor IV, whose family established the Taylor Memorial Award for team leadership. 4:03 p.m., Oct. 23, 2008----If the purpose of Homecoming is to combine football with reunions of old friends, then the get-together at the home of Shirley Nelson last week was a perfect example of the occasion. As an early kickoff to Homecoming weekend on the evening of Thursday, Oct. 16, the widow of former University of Delaware head football coach Dave Nelson hosted dozens of alumni who had played for her husband in the 1950s. A regular event, the gathering drew former teammates who reconnect each year at the party, as well as others who said they stay in touch more often and a sprinkling of those who were attending for the first time. All said they had one overriding reason for joining in this year--to honor the memory of Coach Nelson and reminisce about his legacy. Allen recalled hearing Nelson take phone calls from coaches at such schools as Iowa, Notre Dame and Louisiana State, all seeking his advice and input on their own attempts to try the novel offense. David M. Nelson was the Blue Hens head coach from 1952-65, UD athletics director from 1951-84 and the first dean of what was then the College of Physical Education, Athletics and Recreation. A member of the College Football and Delaware Sports halls of fame, he is remembered not only as the father of the Wing-T but also as the country's foremost authority at the time on college rules. Among those attending this year's reunion were a former player who went on to coach at the college and NFL levels, a one-season player for the Philadelphia Eagles and John Walsh, who graduated in 1958 and coached vice presidential candidate U.S. Sen. Joe Biden (a 1965 UD graduate and former football player himself) when Biden was in high school at Archmere Academy. Paul Mueller recalled graduating in 1953 as an ROTC member and being given the option, as the Korean War was winding down, of delaying his entry into active military service until February. He did so and spent those months as a reserve member of the Eagles. When their season ended, he went on active duty and never returned to the gridiron. He said, however, that football has remained a family activity. Someone who did make football a career for about 12 years after leaving UD was Larry Catuzzi, who played for the Blue Hens in the late '50s, graduating in 1958 and then earning a master's degree in 1966. Catuzzi coached at such schools as the University of Dayton and Ohio State and with the Baltimore Colts before becoming an investment banker. UD Athletics Director Edgar Johnson also stopped by the get-together and shared with the former Blue Hens some of the University's plans for growth and improvements in athletics facilities.